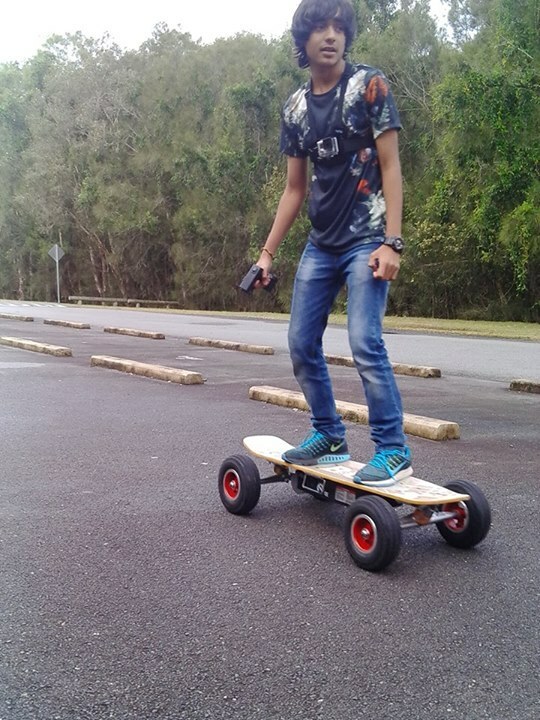 I like to go to places where I can do some activities. South East Queensland is a great place for adventure and activities. Here is a selection that anyone can do. In most of the locations I have listed, you can hire the equipment that you need. So there is no excuse to stay at home, instead there is a vast number of exciting adventures to be had in South East Queensland. Many are suitable for the whole family. 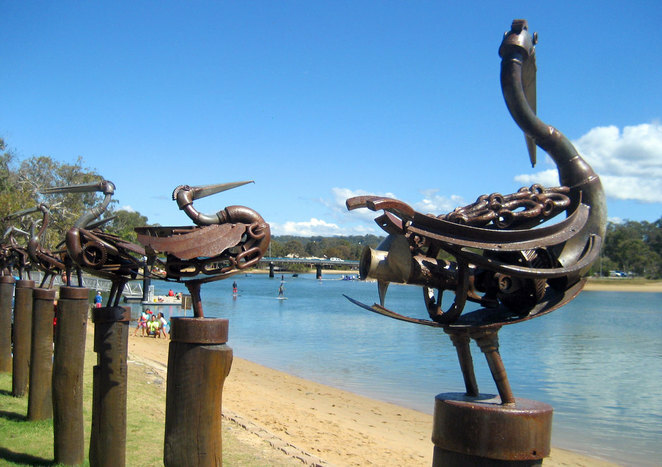 There are lots of places around South East Queensland that are great to explore by bicycle. Bicycles let you cover more territory while also making it easy to enjoy the sights. 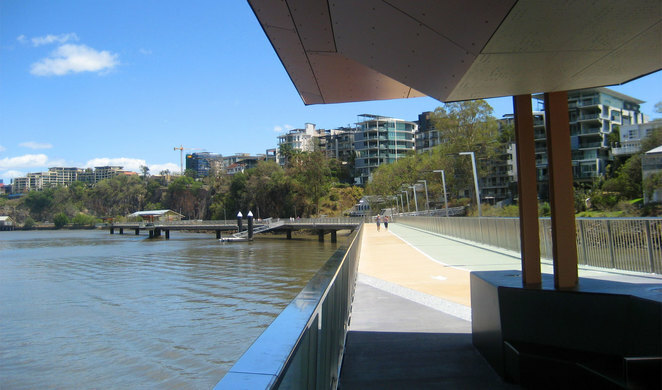 The Brisbane riverfront from Teneriffe through the city out to St Lucia is a wonderful ride that takes you past a number of great places to stop. Highlights include the restaurants in Teneriffe, Powerhouse Museum, New Farm Park, Riverwalk, the City Botanic Gardens, riding under the expressway by the river, and various highlights at the University of Queensland. The best thing is being able to take the ferry back to where you started. There are various places that will hire bicycles out to people and deliver to you, but if you don't have your own bicycle this is a trip to do using the Brisbane CityCycle Bicycles. Further afield there are several beach side locations where you can hire bicycles. They rent bicycles on the beach at Redcliffe on weekends. The casual cyclist could just ride around the Redcliffe area heading up to Scarborough or down to Margate. 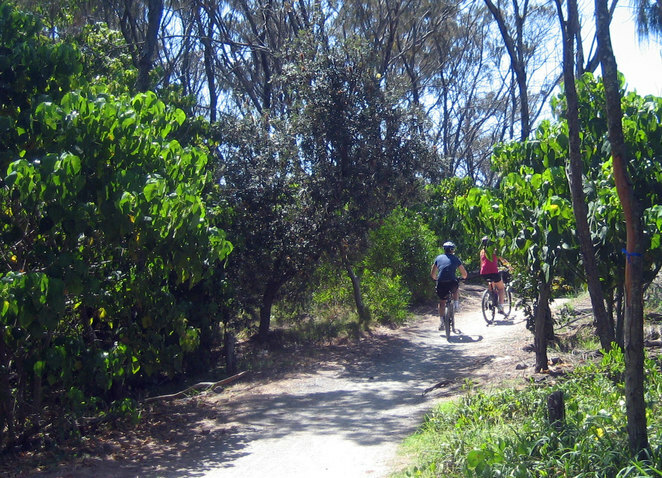 Keen cyclists can do a complete ride all the way down to Shorncliffe and back. The Gold Coast is a popular location for cycling. 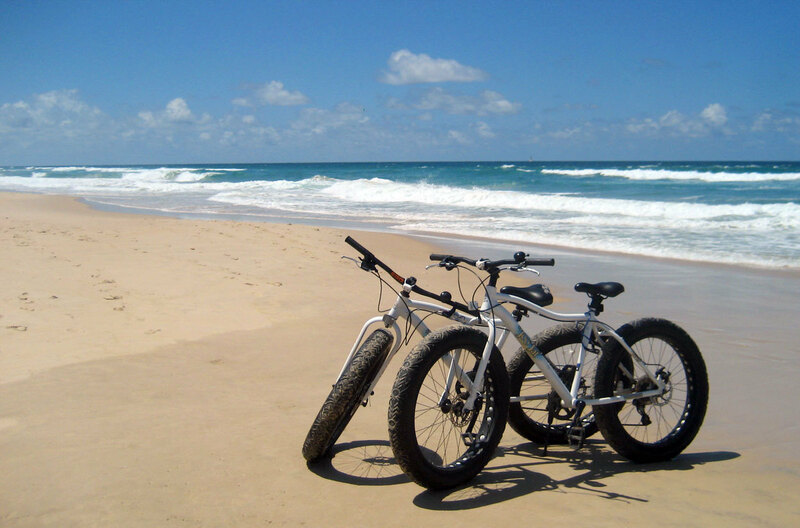 Surfers Paradise has numerous locations that rent out a variety of bicycles including single speed cruisers, mountain bikes and sand bikes with fat wheels for riding on the beach. There are several places in Coolangatta that rent bicycles. If you search around you will find places all along the Gold Coast stretch that rent bicycles. If you are staying in a hotel, usually they can arrange the bicycle rental for you. Some recommended journeys include Broadbeach down to Burleigh Heads. This is nearly all cycling on bike paths along the beach front. If you rent a bicycle at Surfers Paradise the start of the journey is along quiet back streets with marked cycling lanes. Another nice journey is from Coolangatta to Currumbin. My favourite cycling trip on the Gold Coast is from Surfers Paradise up to The Spit. With various stops on this journey it takes 3-4 hours. The path follows along The Esplanade up until it becomes sandy tracks through the bushland up at The Spit. Stops includes the park at Mcintosh Island, the beach at Main Beach, swimming at The Spit, riding out to the end of the spit and fish & chips for lunch at The Spit. The Sunshine Coast also is a good location for cycling. Golden Beach is a great place for a casual cycle. Bill's Boat and Bike Hire is the place to go. You can also cycle up as far as Moffat Beach with plenty of paths to take that keep you off the road as well as quieter side streets. Stand up paddle boards are incredibly popular at the moment. Not only are they fun to try they also let you look down at the water below you, giving you a unique opportunity to view marine life. 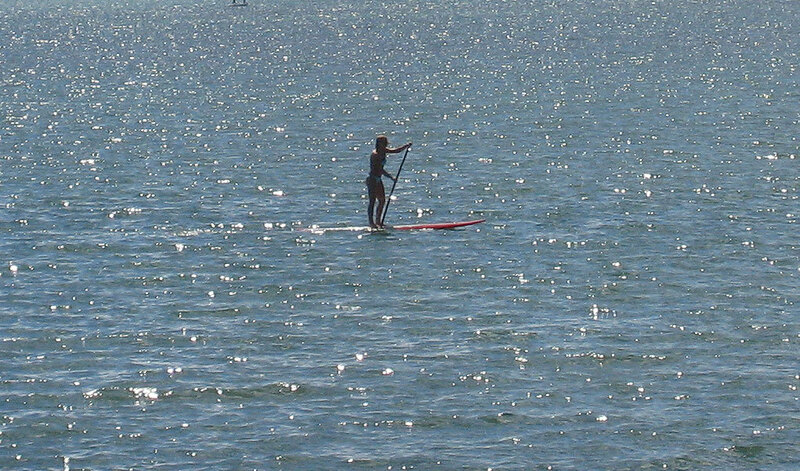 The problem with stand up paddle boards is that standing up is tiring and there is a tendency to fall off. If you look around at places that hire stand up paddle boards, you will notice everyone is standing up on their way out, and often sitting and kneeling on their way back. For the inexperienced, even small waves are a problem. But that is all part of the fun. My preference is usually to explore places in a kayak, but when you are up on the stand up paddle board, the experience is often very different. So I recommend giving them a try. An hour on a paddle board is more than enough for a beginner. 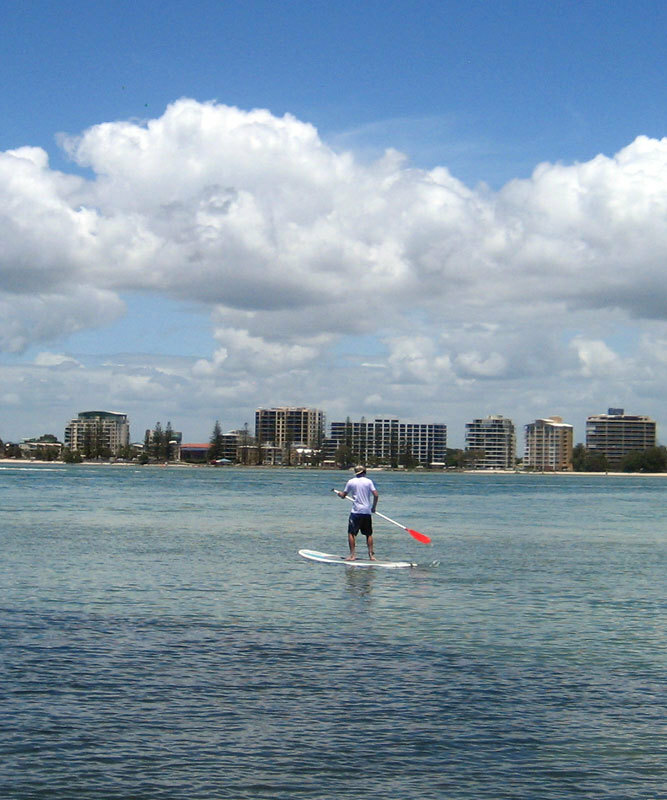 Some great places to try stand up paddle boarding include Currumbin Creek on the Gold Coast, Noosa River up at Noosaville and Pumicestone Passage in Caloundra. 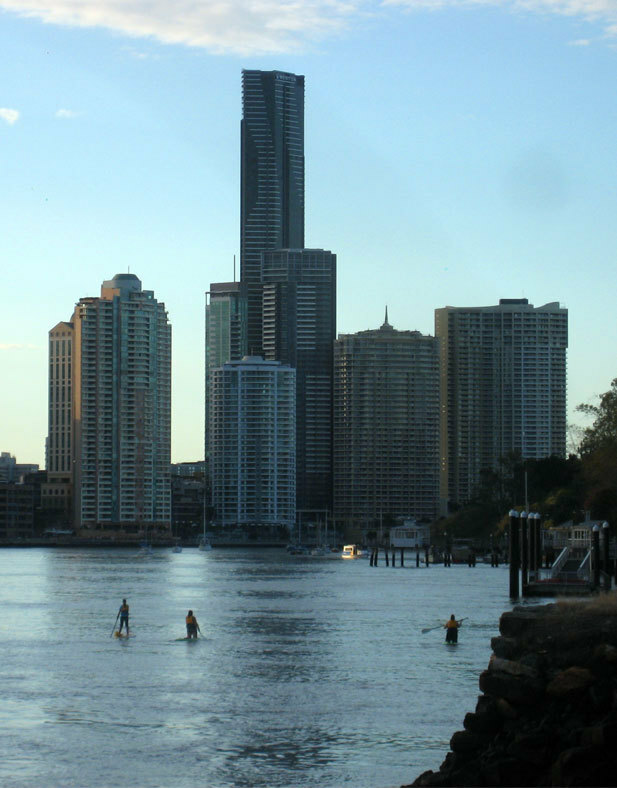 I would give stand up paddle boarding a miss on the Brisbane river, after all, who would want to fall off into that water. More experienced paddle boarders take them out into the surf. 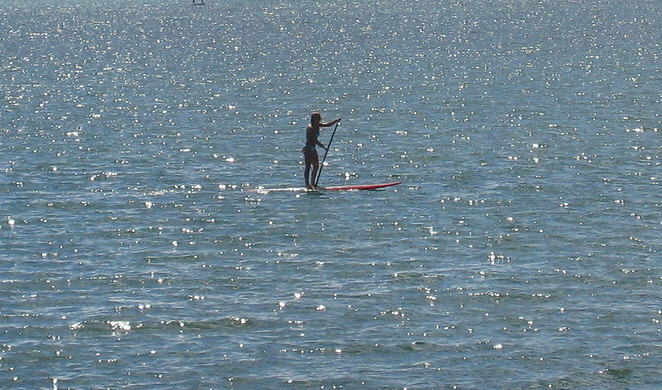 Moreton Bay is very sheltered, so places such as Sandgate, Redcliffe and Wellington Point are popular places to paddle board. Of course if you own your own paddle board there are other numerous places to go. 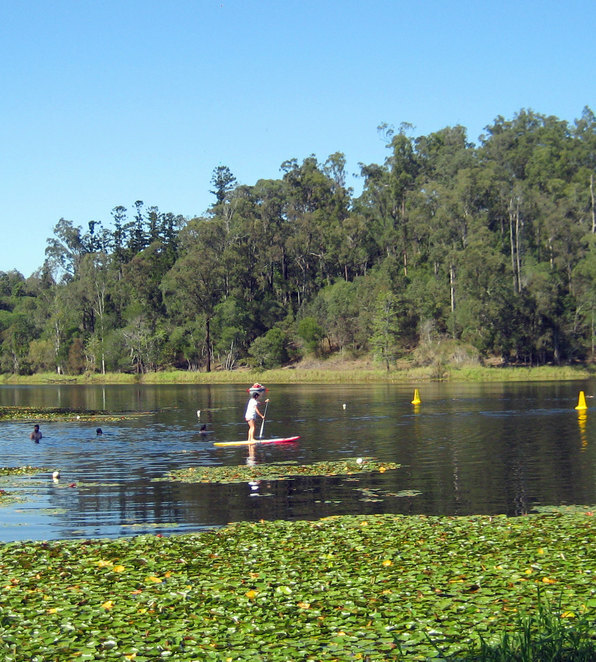 The various lakes around Brisbane that are open to paddle craft are great options for paddle boarding. 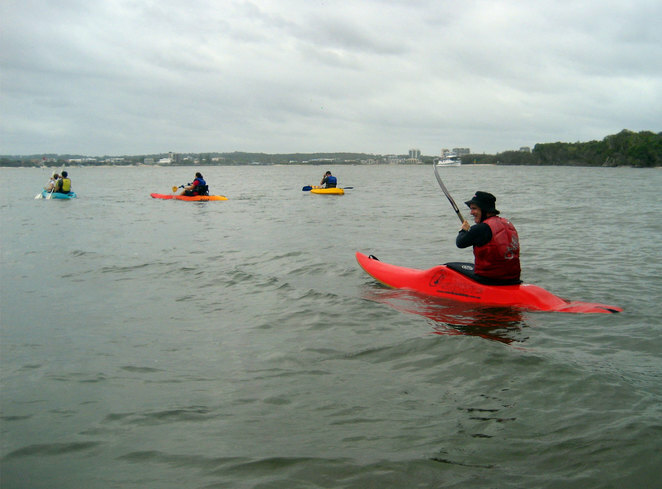 Kayaking is a great adventure and easy for even the complete beginner to have a go at. Most places rent sit on top kayaks that are stable, impossible to sink and easy enough to get back on if you fall off or they turn over. Also, by Queensland law, they must offer you life vests when you rent a kayak, so they are also extremely safe. Some places also rent better quality kayaks if you are looking to do more serious journeys or even head out to sea. Pretty much every place that rents of out paddle boards also rents out kayaks. The difference is that kayaks are great if you want to explore a location. 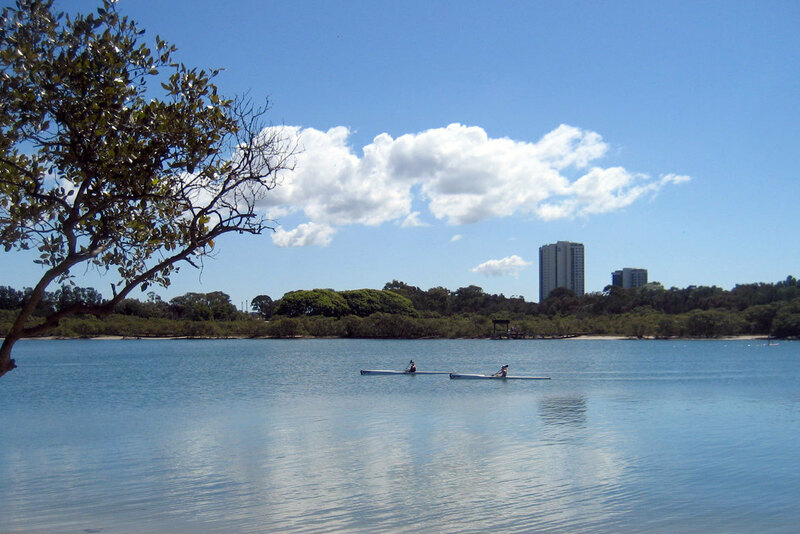 So whether you want to paddle up and down the Brisbane River at night or travel up to the Noosa Everglades, this is the preferred mode of transportation for people who are fitter. Beginners usually find even a 2 hour trip tiring, but you can go a long way in 2 hours. You really want to build up your experience and fitness if you want to do a longer trip. 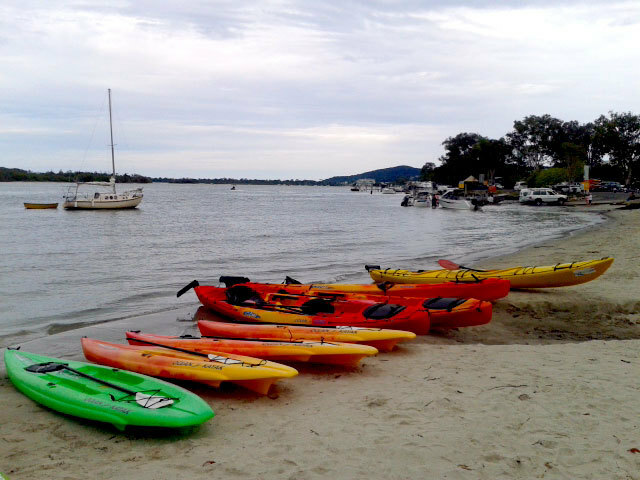 A fun trip could be to paddle out to somewhere like Bribie Island, than have a picnic lunch and then paddle back. Luke from Ego Fun was telling me how much he loves all devices electrical. 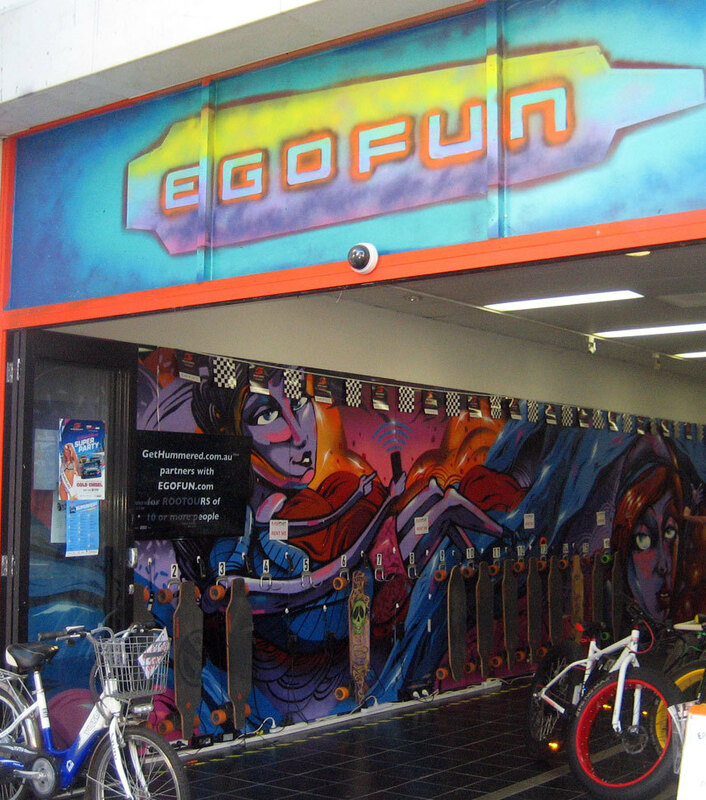 His shops stock electric bikes, electric skateboards, mini-segways and other devices. Electric bikes seem like a lazy option, but the electrical power only assists you in pedaling. 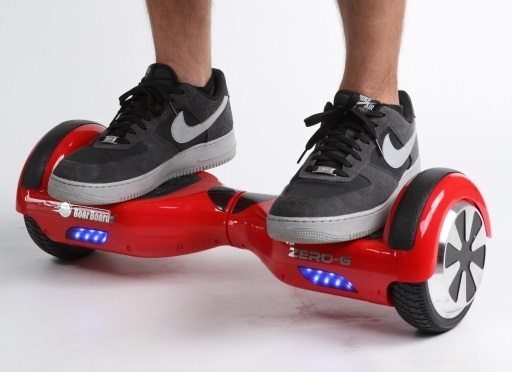 So you can go further than you would and handle hills easily. On sand, electric beach bikes are a fun way to ride along any beach (without the electric power, let me assure you that riding on the beach is really hard). Meanwhile electric skateboards and mini-segways are great for cruising along the esplanade. 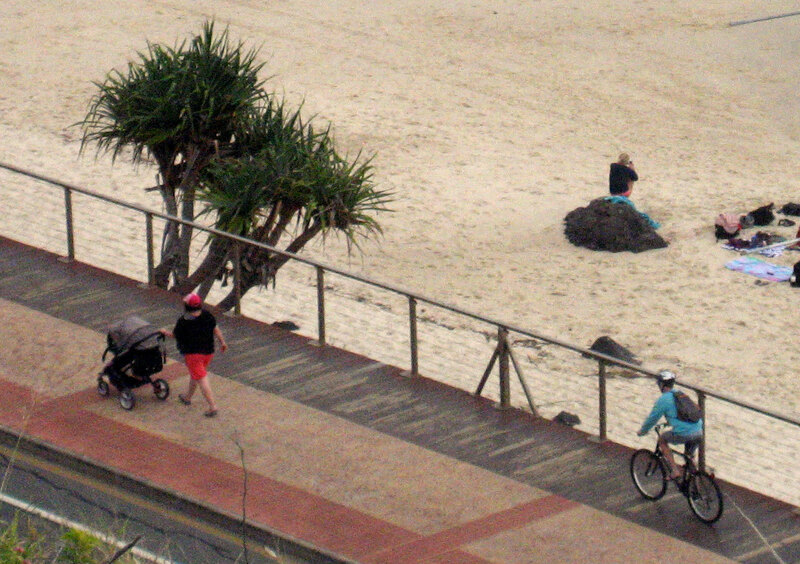 Meanwhile off-road segways let you cruise the beaches in style. Currently the best places to find these for rent are on the Gold Coast at Surfers Paradise and at South Bank, but expect them to be everywhere in a year or so. Many of these devices are going to end up under people's Christmas trees, however as more end up on the streets and in parks, greater restrictions will be placed on where you can use them. The normal city sidewalk is usually too crowded anyway, though people are using them to get to work. 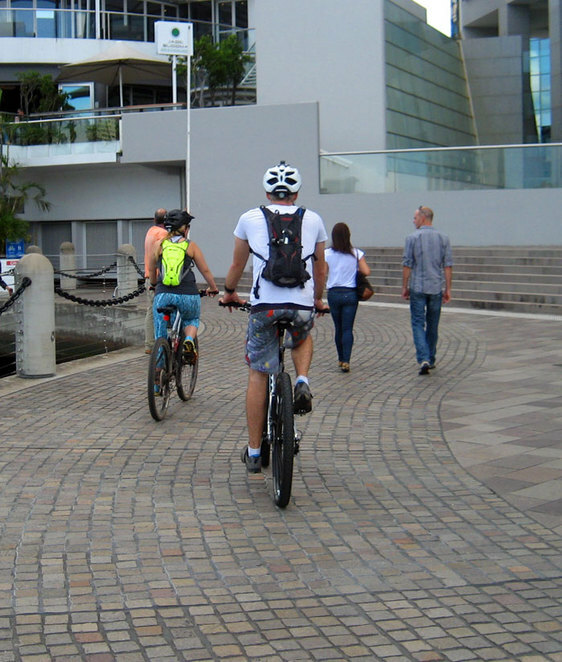 Better to head to cycle paths in parks and along side beaches and just cruise. You will see that while you can ride them around South Bank there are lots of paths around there with "No Segway" signs. Are you one of those people who stand at the edge of a cliff and a little voice in your head says "jump"? If so, then the best solution is to rope up and jump off a cliff in a safe way. Much easier than climbing up a cliff, abseiling down one is easy and safe. There are plenty of amazing places to try abseiling. Right in the city you can of course abseil down the Kangaroo Point Cliffs and the Story Bridge with Riverlife. 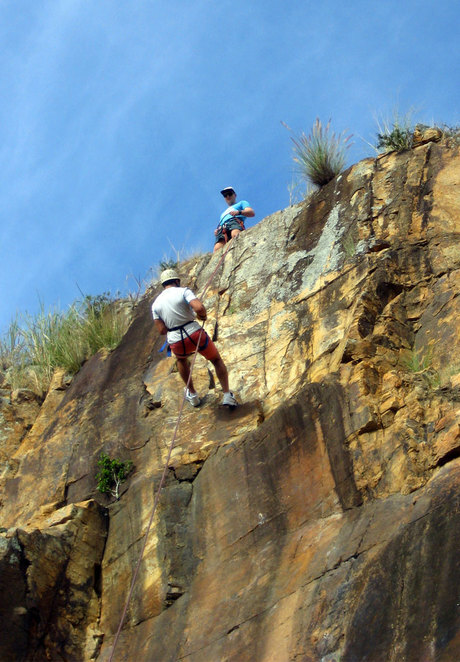 If you want a more exotic location, then the Glass House Mountains provide the perfect backdrop for abseiling. Mt Ngungun is a half hour hike up and a quick jump down. 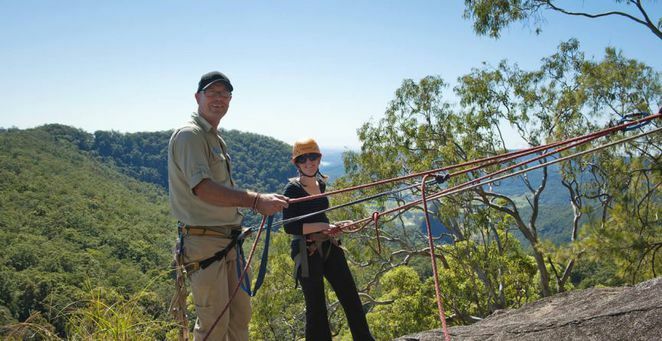 Down south in the Gold Coast Hinterlands, The Binna Burra Lodge offers abseiling courses that start you off on a nice easy 10 m cliff, then moves you up to 40 and 90 m cliffs. Compared with other items on this list, hiking doesn't seem like much of an adventure. However it all depends on the hike. 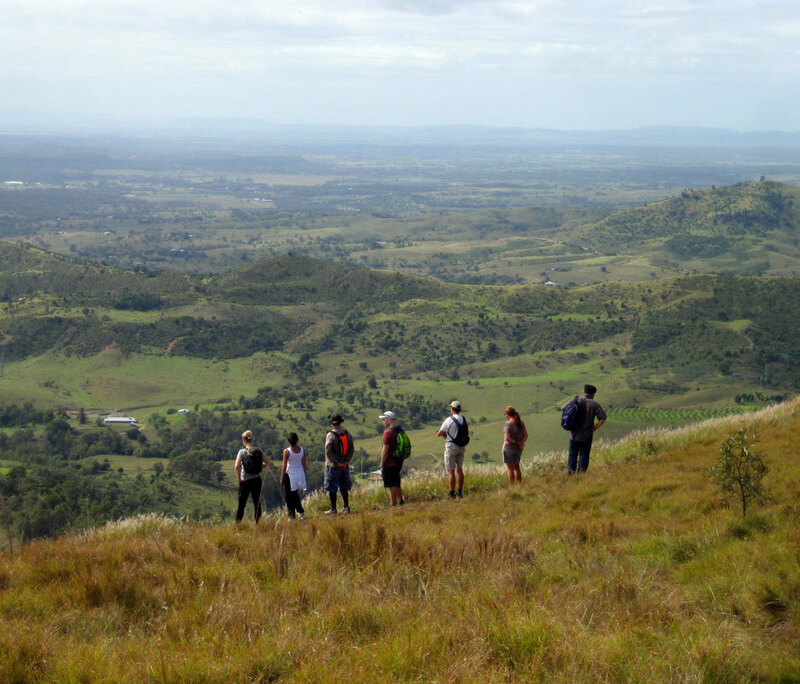 South East Queensland is home to a vast range of hikes, from short strolls through to challenging hikes that involve scrambling and climbing up mountains. If you are looking for a bit of adventure in your hiking then you can choose some of the more fun, but less lofty hills. The Glass House Mountains is home to great views. 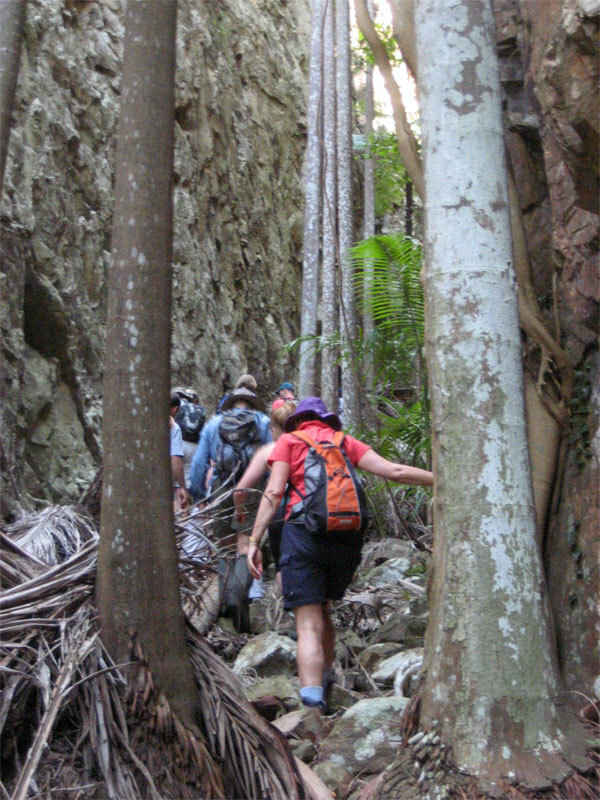 Mt Tibrogargan attracts most people's attention as the mountain to ascend in the Glass House Mountains. If your fitness or vertigo levels keep you away from this peak, why not try one of the many other hills that are around. Mt Ngungun is a popular walk, but you should also consider Mt Tibberoowuccum as an interesting walk with a scramble up at the end which is not overly challenging. 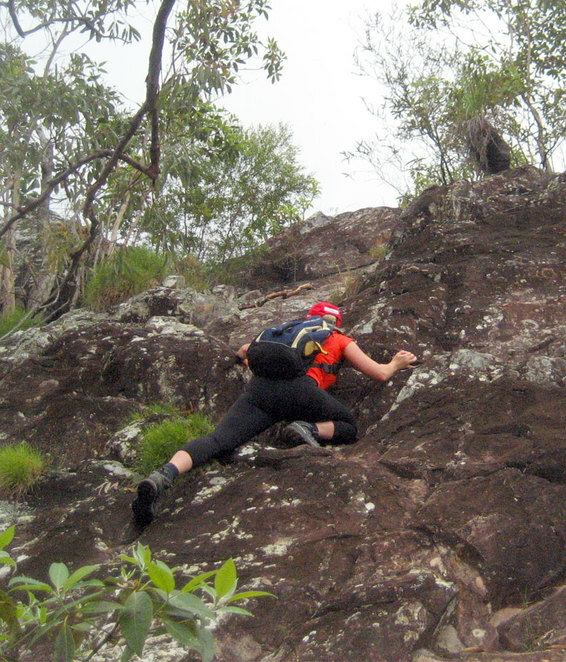 For something more challenging consider Mt Greville. What makes this hike interesting is ascending up and down narrow palm tree-filled gorges and the 360 degree view at the top. For more of a challenge, consider tackling a hike such as Mt Maroon or even Mt Barney. 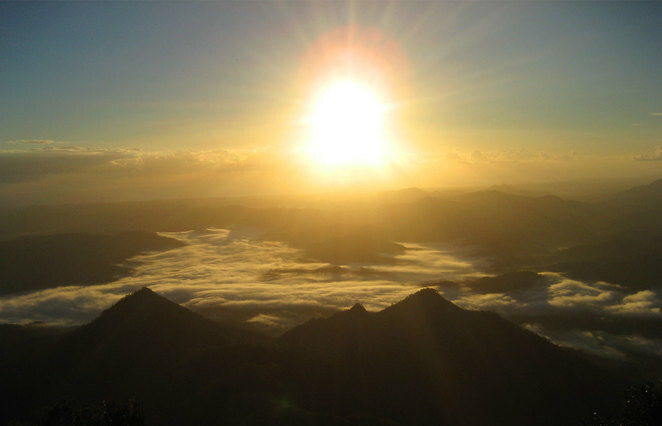 The biggest easy hiking adventure is across the border with a night time hike to view the sunrise at Mt Warning.